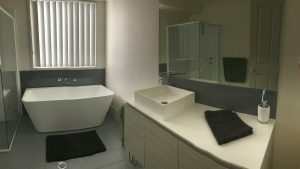 Thanks to Ozzie and Andrea we got finally our dream Bathroom completed. 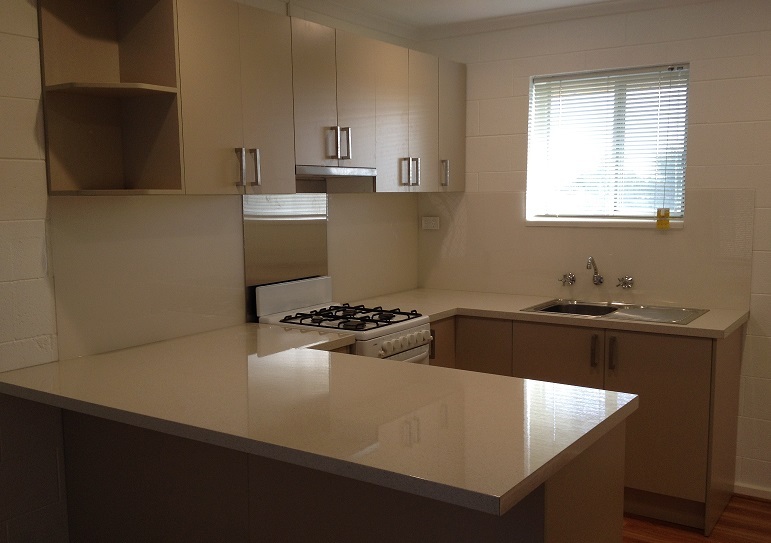 We are thrilled with the quality and workmanship. 5* service all the way. 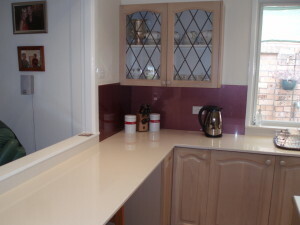 I would recommend Ozzie Splashbacks to anyone. Their friendly customer service is second to none. 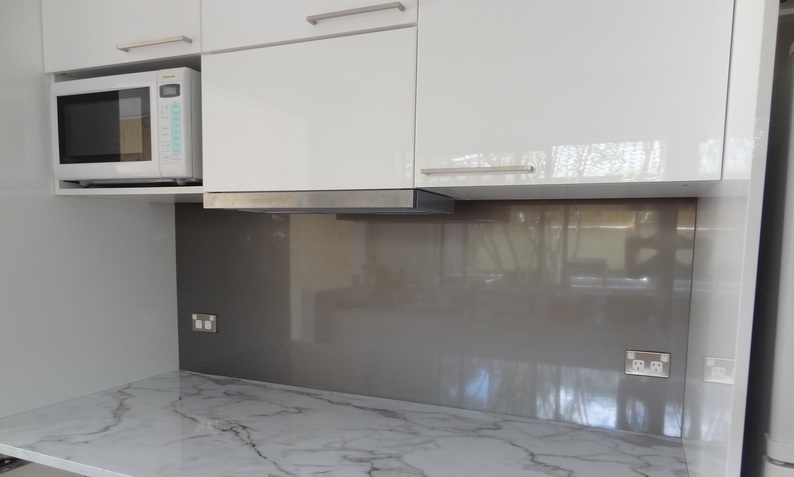 When Oswald came out to measure, he gave me great advice as to what colour and product to have and I now have a beautiful Mirror splashback that compliments my kitchen beautifully. for arranging our beautiful splashback. Excellent service definitely give a 5 *****recommendation. 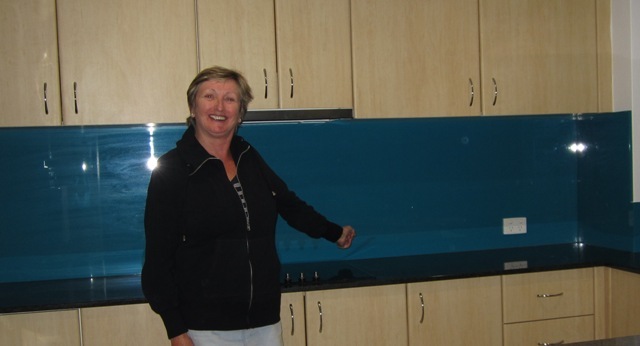 Many thanks to you and Ozzie for your wonderful service in regard to our recent kitchen splashbacks. As you know, we had experienced some major issues with other tradespeople during our renovation, yet with Ozzie’s help, we have managed to overcome a lot of obstacles. It was such a pleasure to deal with such a professional team, not to mention the dog cuddles in the process. 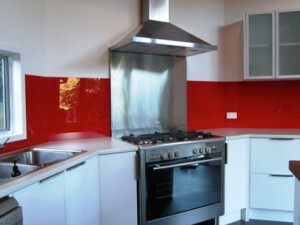 Your support and advice in choosing our splashback colour was much appreciated. I will send final photos once the window trims have gone in. Thanks again and best wishes for Christmas and the New Year. Thanks for your support on this little project. I have attached a photo of the finished laundry. It looks really good and I can’t speak highly enough of your product and the way you conduct your business. Ozzie knows his stuff and loves a friendly chat. 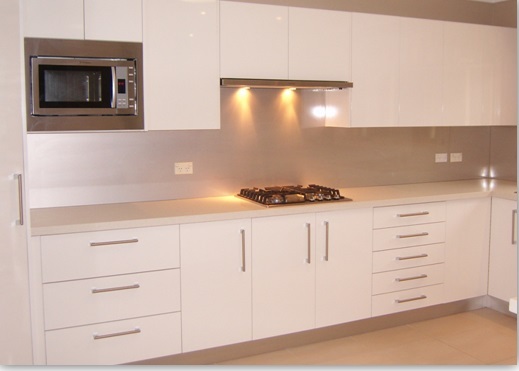 We searched the web for splashback companies here on the Central Coast. We decided on OZZIE Splash and have not been disappointed. From the Initial consultation through the finished installation has been the most friendly and professional experience. Thank you both for your very professional and careful work. Very happy with our “new” kitchen Splashback and the colour. 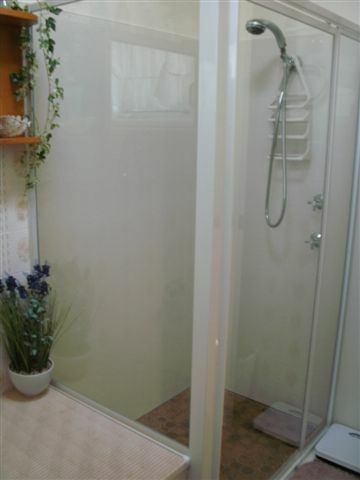 We have used OzzieSplash in our kitchen and bathroom before. 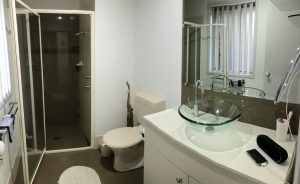 We just renovated another bathroom and used OzzieSplash for the third time. Love you guys and your work and would highly recommend OzzieSplash. I would like to thank you and give a huge thumbs up to the excellent friendly service we received. Both our jobs were done within a prompt time frame, with no fuss and stress, which was brilliant. We will certainly be recommending OzzieSplash to anyone we know, whether it be bathroom, kitchen, laundry or misc. and would have no hesitation in doing so. It does look like a sheet of glass over the walls. 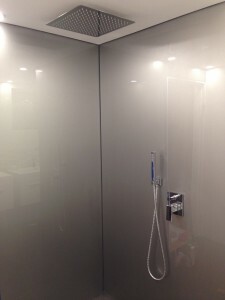 Just a few shots to show you our finished result with the shower splashbacks. Sorry if the images are not great but the space is a little tight to get good shots. Anyhow, we are very happy with the end result. 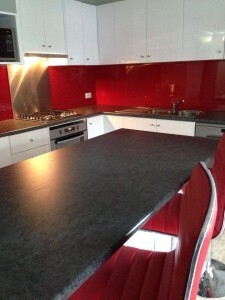 The service, the packaging of the splashback and the colour and cutting is impressing. We are happy we chose the colour to match our wall colour. 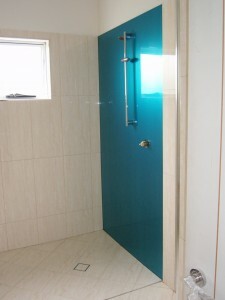 I am very happy to recommend your product to anyone contemplating a bathroom renovation. 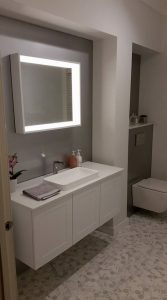 After much research and debate, we ordered the acrylic splashbacks for our powder room from Ozziesplash and chose the DIY measure and install option. Our plumber scratched one of the panels while installing the toilet and Ozzie came and repaired it like new. We were so impressed with the product and the service that we ordered another huge splashback for our laundry. In the meantime here is our finished powder room with three panels in custom grey metallic. 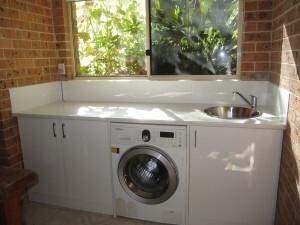 Attached is a pic of the laundry finished. Fast, efficient and excellent service. Helpful and happy to assist with any queries and good information provided. Exceeded our expectations Product looks classy and was easy to fit. Cut was exactly as per measurements requested. Would be happy to deal with you again and highly recommend your business. A pleasure for us from beginning to end. We LOVE the colour and the finish. Really appreciate the way you do business. 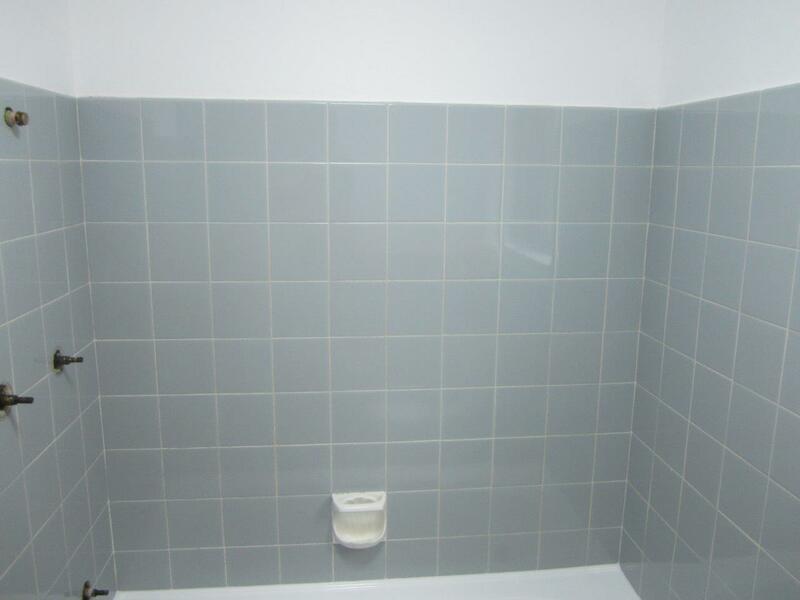 Our tenant will find not having to worry about cleaning tiles (and grout) a great time saver. 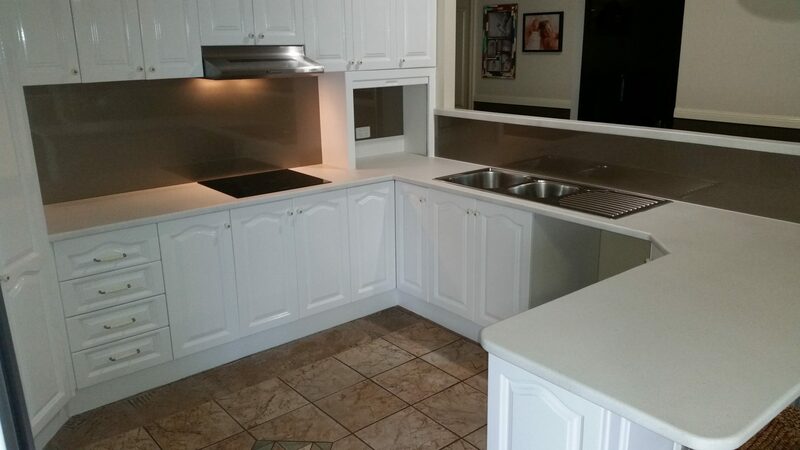 Again, thank you both for your exemplary customer service with the measure-up, quoting and installation of a splash back for a rental property kitchen and laundry. 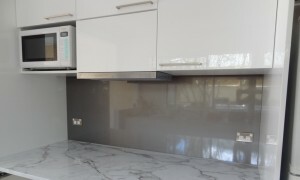 As with our own kitchen, the acrylic covering in exactly the right colour and the Metaline (Laminex) insert behind the cooktop will wear well and I expect our tenant will find not having to worry about cleaning tiles (and grout) a great time saver. Ozzie came and did a final measure and template, then had a call the following day to say the splashback was ready for installation! Very professional service and excellent value too. Would highly recommend this company again. Thank you, Ozzie and Andrea! Thank you for this beautiful splash back and wall protector in my hair salon. 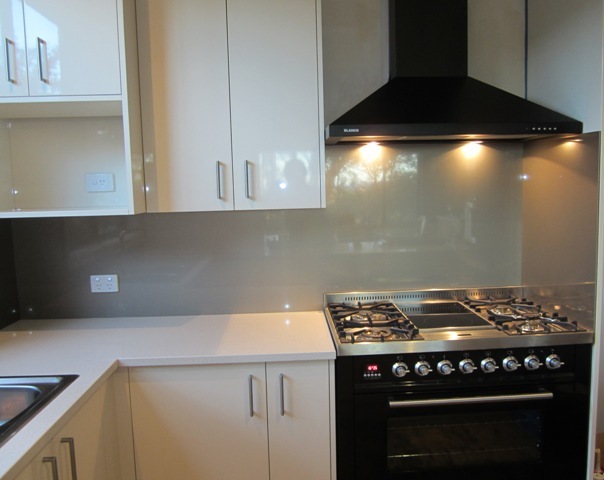 Glass Splashback behind the whole cooktop area and a colour matching Acrylic Splashback around the sink. We are delighted with our splashback. Ozzie did a great job installing it and we would have no hesitation in recommending OzzieSplash to anyone contemplating renovating their kitchen. It was a pleasure dealing with you both and please feel free to utilise the photos Ozzie took. 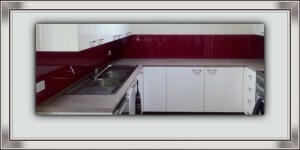 We are very happy with your product, installation and service. Andrea was very helpful and promptly replied to emails and phone calls. 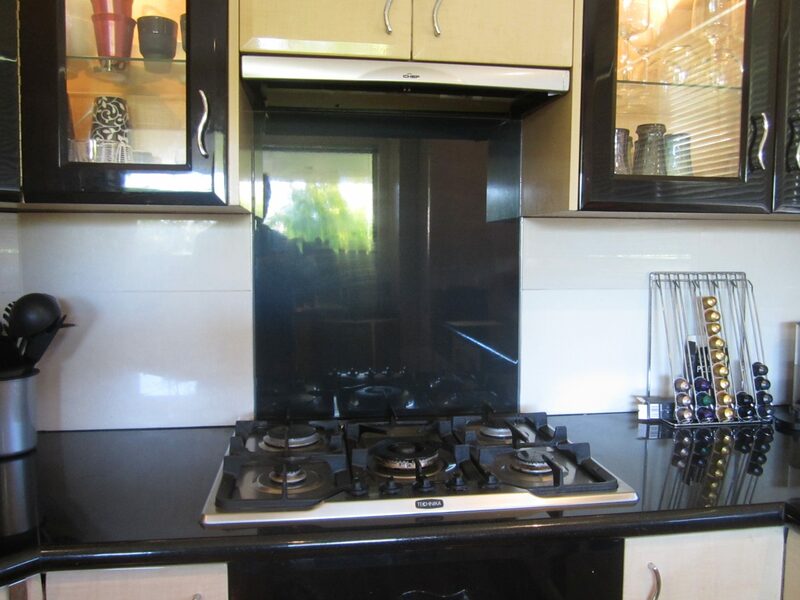 The splashback quality and finish is very good. 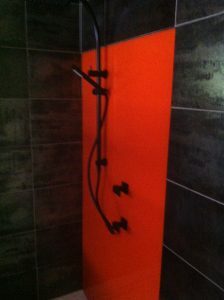 My wife Dee & I would just like to thank Ozzie & Andrea for the most beautiful bright orange splashback wall in our bathroom! They were so professional & friendly. 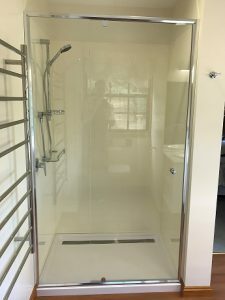 Not only did they show up when they said they would, which is very rare on the central coast these days , but when they said it would take up to 10 days, it was manufactured earlier on which they contacted me & asked if I would like it installed as soon as possible, which we did. Everyone has commented on our bathroom since we are very happy with the result & would recommend Ozziesplash to all our friends & family. I went for the DIY option and the install was so straight forward, even a girl (that’s me!!) can do it. Fantastic service from Ozzie and Andrea. 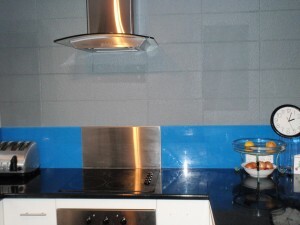 Other companies quoted several weeks lead time, but OzzieSplash had my splashback made and delivered in a week. Great quality and the ability to choose the colour from the Dulux chart was an added bonus. 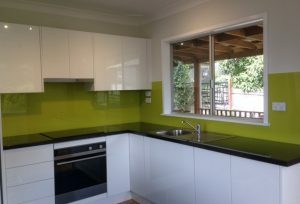 To Andrea and Ozzie just a note to say how thrilled my husband and I are with the end result of our glass splashback. The colour is perfect just what I wanted. We must commend you both on your professionalism and customer service from start to finish . 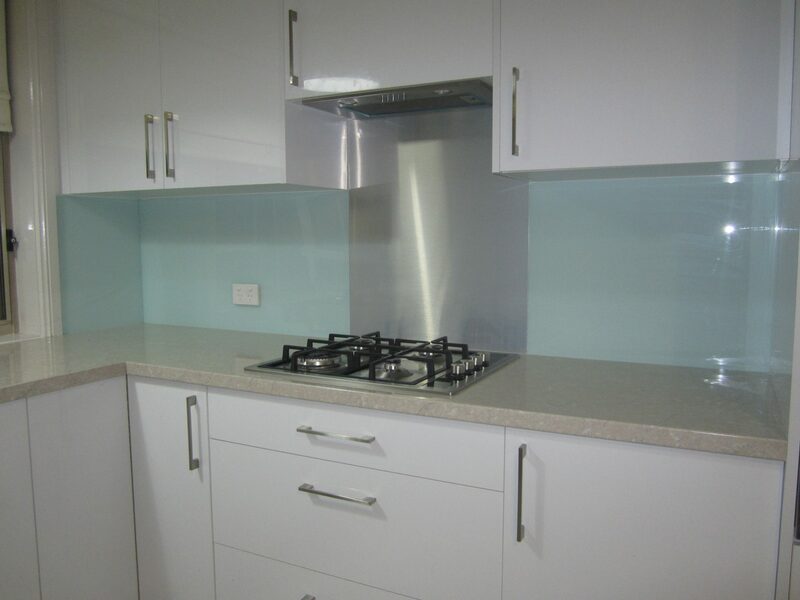 We would be happy to recommend your business to anyone who was interested in a splashback . 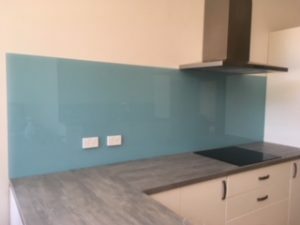 We would just like to thank Ozziesplash for the absolutely amazing Acrylic Splashback we had installed recently, love, love, love the colour and how it completed our new kitchen. We cannot thank Oswald and Andrea enough for there awesome service, they went above and beyond to measure and install in a very short time frame. Ozziesplash we highly recommend you. Can I just say how happy I am about the product and the service….. it is the finishing touch to the kitchen I always dreamed of. Love supporting local businesses . We’ll be coming back for bathroom splashbacks soon. Thank you so much for installing our beautiful splashbacks in matching colours in our kitchen and laundry. Andrea & Oswald were a pleasure to deal with. They were so helpful with the various options they provided us with so that we could make our final decision. 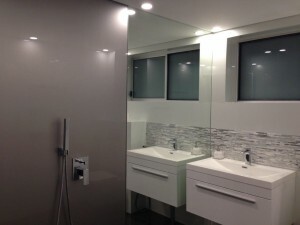 Once we ordered, the turn around was very fast and the installation was quick and very professional. 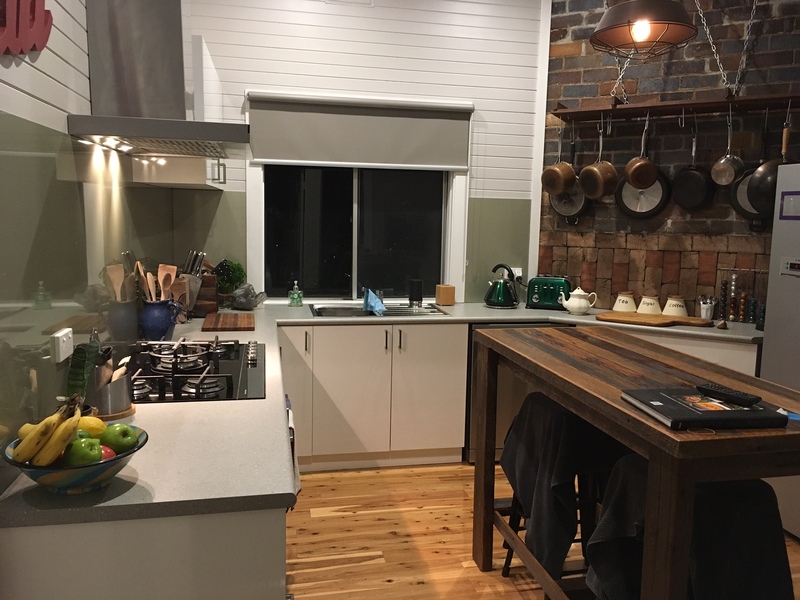 I just wanted to put in writing what a wonderful experience I had with yourselves at OzzieSplash in regards to my DIY Splashback project for my kitchen in Moss Vale. 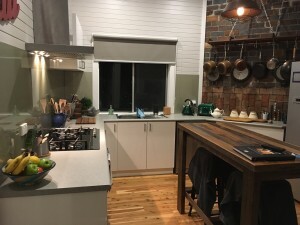 Having been to a major hardware chain in the Southern Highlands for advice on my project I found them to be totally vague in their advertised promises to assist from start to finish. Not only was the product inferior to what we decided on with OzzieSplash but I was advised that I would have to cut the sheets myself. Also the colour we decided on could not be arranged or painted to our choice. 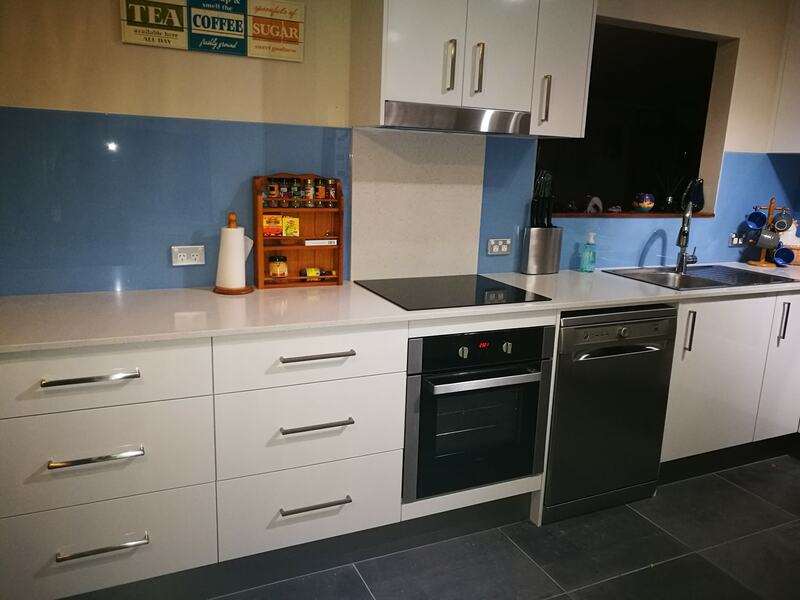 With great assistance from your website, telephone conversations with you both and the professional approach you gave my DIY project was a complete success. We were so happy when we saw how the product was packed on arrival and the colour painted by Oswald was exactly what we wanted. 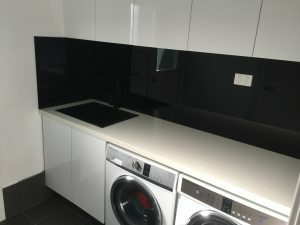 Overall our experience with OzzieSplash was so good we have recommended to a lot of friends and family that if doing a DIY splashback they must contact yourselves in the first instance. My wife and I thank you again for taking the angst out of this project which initially we thought was going to be a long drawn out process following our first approach with the hardware chain. I found Oswald extremely easy to deal with and very professional in his work. It was a pleasure to do business with OzzieSplash and my new White splashback looks great. Thanks for your support on this little DIY project. 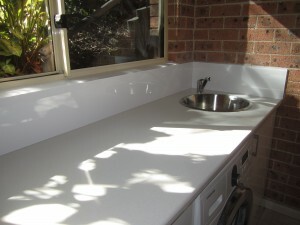 I have recently had Ozzie Splashbacks installed around my kitchen bench areas. 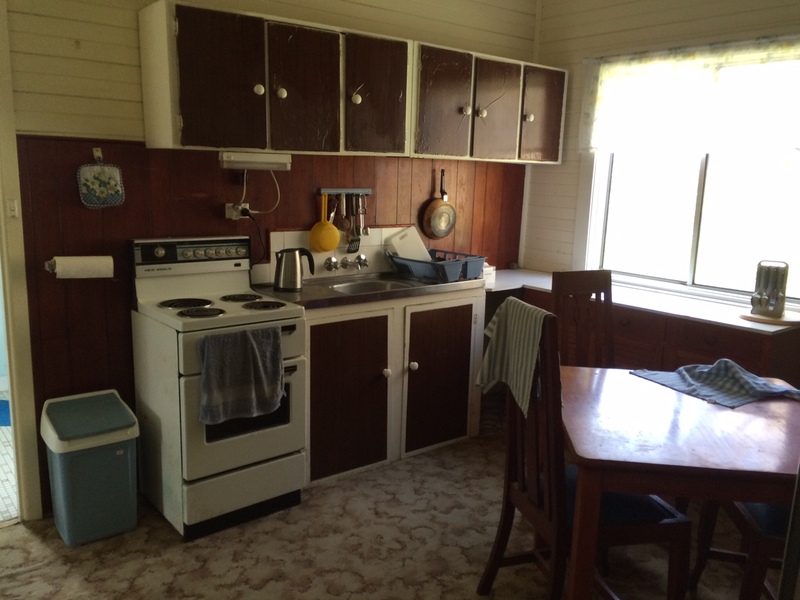 They look amazing and have made an old kitchen look new and fresh again! Great bunch of people to deal with, very happy! 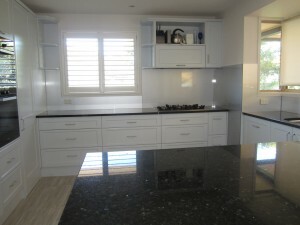 One of the best suppliers I’ve dealt with in doing my home renovation. Great, professional service from start to finish. Very pleased with my glass splashbacks installed today. 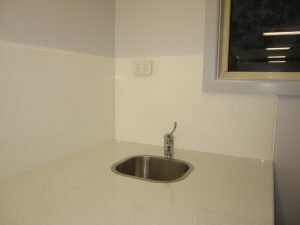 We had our splash back installed last week and we are very happy with our purchase. Oswald did a great job accurately cutting and installing the 3 panels covering our U-shape kitchen walls. The cut were required for the window and following the contour of our arched shaped range hood. 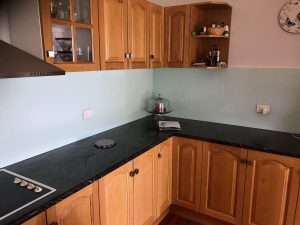 I was initially having a glass splash back in my kitchen but due to having 2 Windows on 1 walk I was disappointed to find out I had to have joins,. 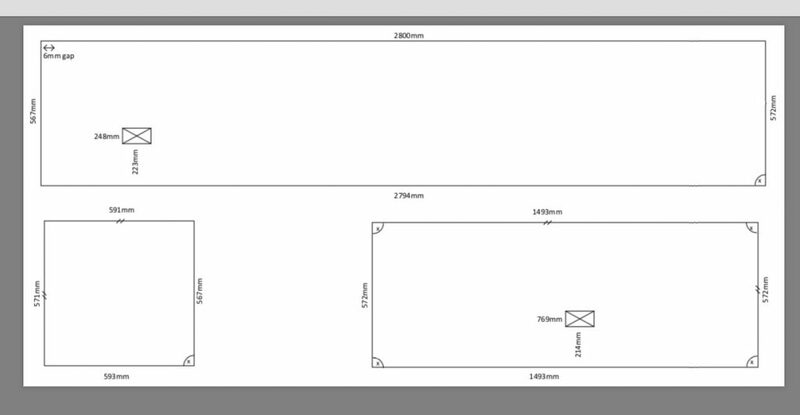 I wasn’t keen on tiles so I did some research online & saw Ozziesplash & immediately called Andrea & went to visit with my design & measurements! 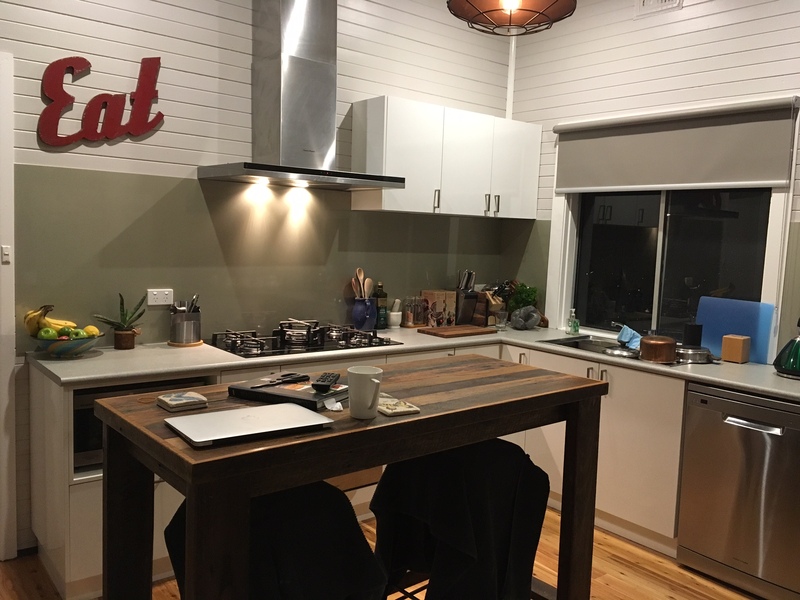 Ozzie & Norbert made a template on site & the following week my splash back was installed! 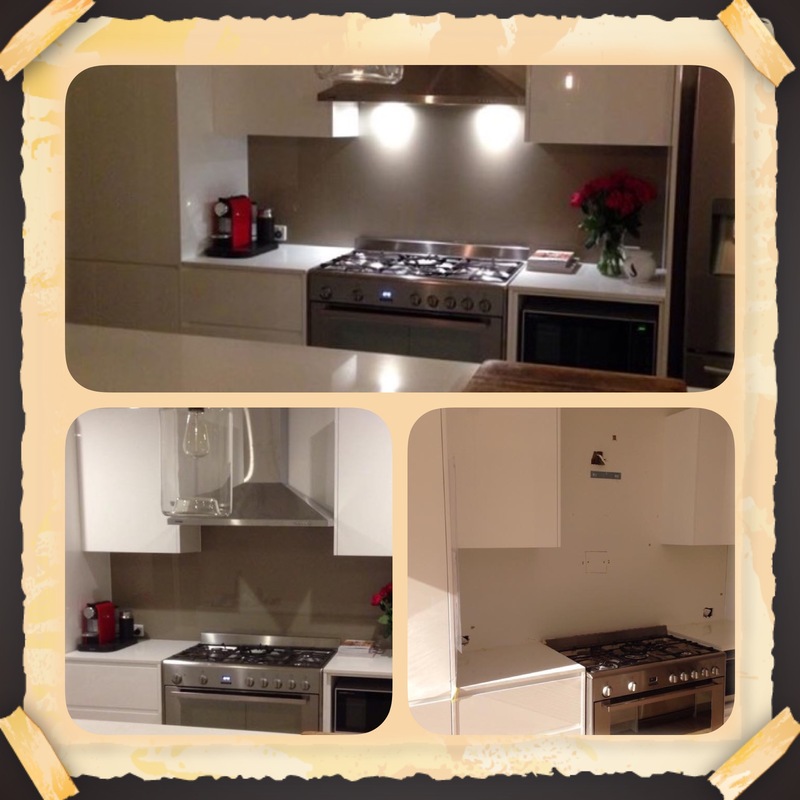 I was very impressed with the team & my kitchen looks amazing with the seamless splash back I had wanted. Ozzie, you’ve done it again!!!! This is our second time dealing with OzzieSplash. We used your product already and it is brilliant; no mouldy grout, smooth lines & easy cleaning. We kept the business card until we were ready to buy again, and renovated our ensuite using OzzieSplash in the shower. My husband, being a builder chose the DIY option. Ozzie & Andrea were so helpful, checking & double checking measurements, sending out sample colours. All our questions were answered with immediate action. We’ve now renovated another bathroom using Ozzie again. We couldn’t be happier with the end result. There was a lot of deliberation (on our part) regarding choosing the perfect colour & Andrea was most helpful (and patient). We needed the panels asap after deciding on the colour & had them delivered to us within the week. We wouldn’t hesitate to recommend Ozzie Splash. They are thoughtful, quick, professional and go that extra mile. 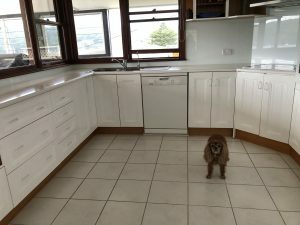 This is the third time Ozzie has done a project for me, as I have moved house and as usual the service and final job was fabulous, both kitchen and laundry. 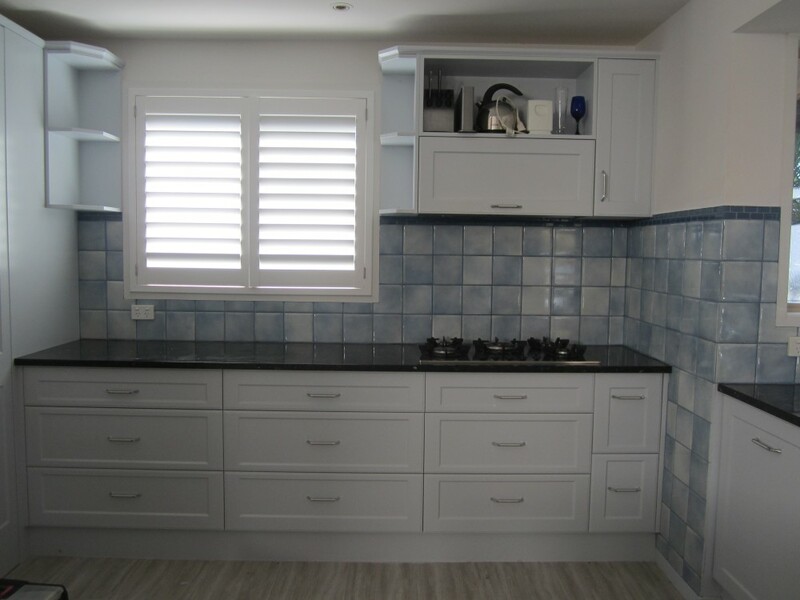 Would recommend Ozzie for anyone renovating, or just needing a revamp, just ask him he has great ideas for you and the final result is much easier to clean than tiles. It has made a world of difference to the look of my kitchen. I am very pleased with my new splashback. It has made a world of difference to the look of my kitchen. The experience of dealing with your company has been pleasurable from start to finish. Both Oswald and yourself are so friendly, responsive and efficient. The job was handled in a highly professional manner throughout. I will have no hesitation in recommending you to others. 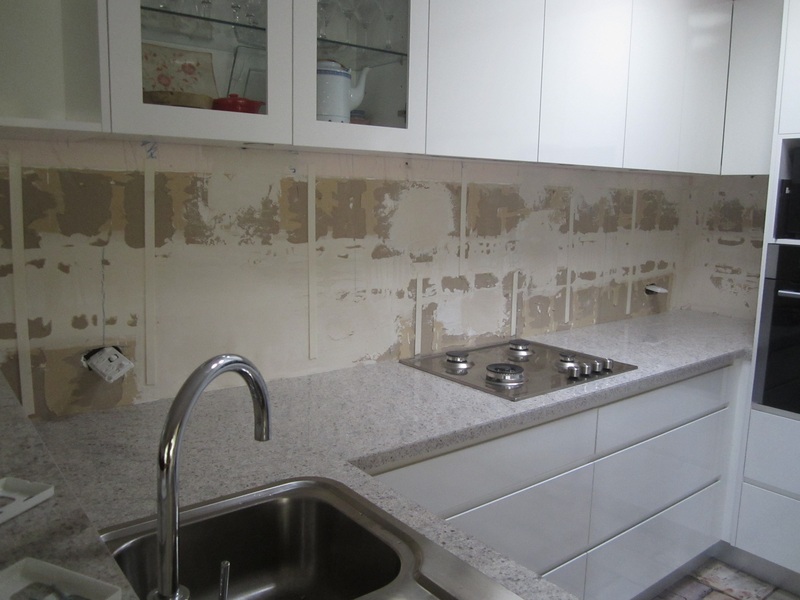 The splashback went very well for an old wonky house, we only had to make some really minor adjustments. 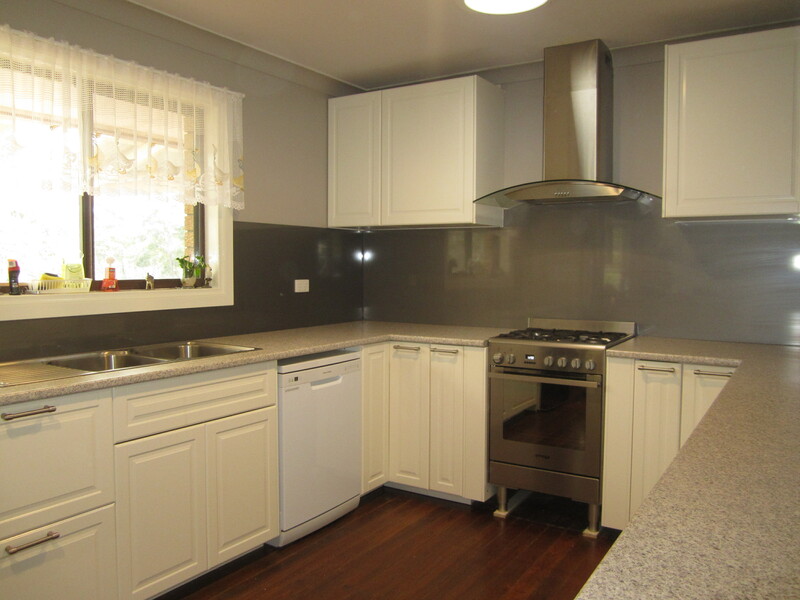 I think it looks great and it really finished off the kitchen. 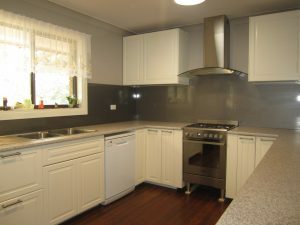 I’ve attached a photo of the kitchen complete and of it originally. I am thrilled with the colour you suggested, it turned out to be perfect. I just wanted to thank you both for the splashback in my kitchen, it looks sensational. Your products was far superior to other companies I had contacted. Also I want to thank you for your professionalism. I will be only too happy to recommend you to my friends. 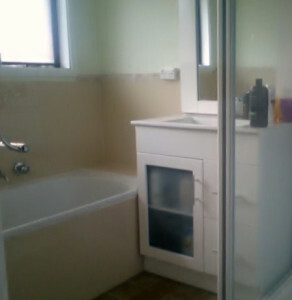 I plan on redoing my bathroom in the not too distant future, so I should contact you then. In the meantime, once again many thanks. Oswald and Andrea clearly run a great business here. Great service and everything was done so professionally and the result was outstanding at a great price. I cannot express my gratitude enough to Oswald & Andrea for their quick and thorough service. 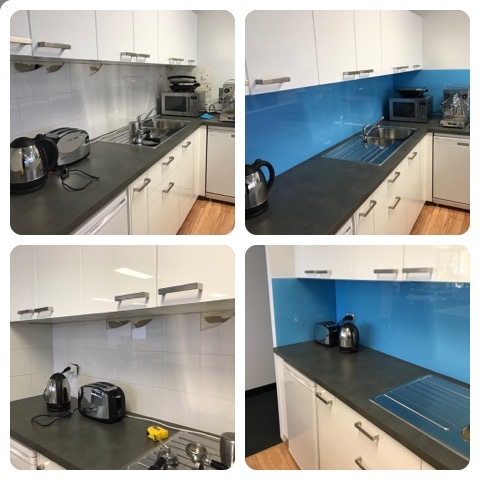 I went to the Showroom on Friday to enquire about replacing our cracked splashback that afternoon Oswald arrived to measure up and the very next day (Saturday) it was installed and looks fantastic. Thank you so much highly recommend OzzieSplash fantastic service and great products! Andrea and Ozzie from OzzieSplash are a winning team, they are hard working, polite, on time, and clean and tidy. Ozzie worked just as hard on the measuring as he did on the installment, ensuring a perfect fit and finish despite a few wonky walls and slightly not level cabinets. Andrea kept me informed throughout the manufacturing of the Splash back and let me know what was happening at all stages. A real pair of the finest trades people I met. I would recommend them to anyone who wants a professional job done, and doesn’t want to be messed about. 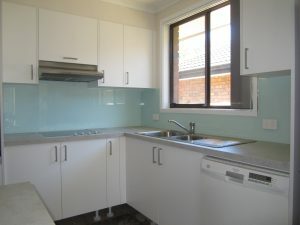 My kitchen looks stunning and I know who I chose for my bathroom renovation . Thanks Guys. We initially found the OzzieSplash product and installation service as part of our internet research for kitchen replacement. We decided to obtain a quotation from you and proceded to an order after being impressed with your prompt and professional attention to our enquiry. True to the testimonials on your website, the order was completed on time and in accordance with our high expectations for product quality and workmanship. Having dealt with contractors over many years, my wife and I prefer to do business with owner operators where possible. To prospective splashback customers and based on our experience; Oswald and Andrea operate a very personalised business and are a credit to their industry. 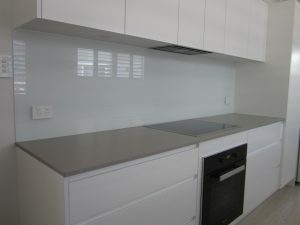 We would recommend OzzieSplash to any body who is considering the installation of a splash back. We do small jobs, large jobs , different materials and lots of colours. Just a email to say thank you for your excellent product and timely production. 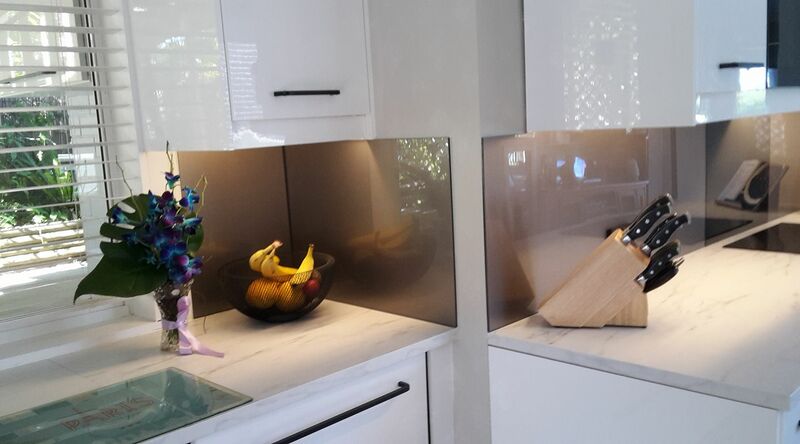 I have fitted my new splash backs this last weekend – only took 15 minutes. A great result, wife likes it too ( huge relief ). Will be using you again for another upcoming project. “OzzieSplash is absolutely fantastic, don’t look elsewhere! Ozzie and Andrea helped me out just before we sold this property. I would recommend OzzieSplash to anyone looking for a wonderful, personalised and fast service. We will definitively be using them again for the next place. I already have a colour on my mind for the kitchen and I will use Acrylic for my bathrooms without a doubt. It has been a sincere pleasure to do business with OzzieSplash. From my initial contact with you your assistance and advice has been so professional … you both went out of your way to fit in with our busy lifestyles and we are grateful for this. 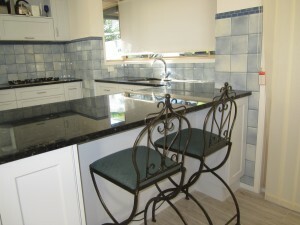 Our kitchen now looks very smick … we are delighted with our choice of colour and of course, your product and service. Again, thank you … we will certainly recommend OzzieSplash , you and your products to our families and friends. I do not hesitate to recommend Oswald and Andrea from OzzieSplash. I was attracted to the family business feel, and that proved correct. from other companies and hardware stores, but OzzieSplash certainly didn’t fall into that category. I called OzzieSplash and was not at all disappointed. I was thrilled with the quality of acrylic and the workmanship and particularly the attention to detail to create a first class finish. 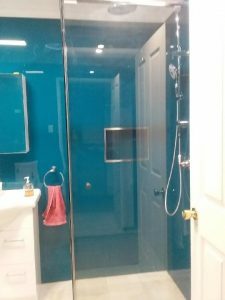 My Acrylic shower wall looks like glass, is grout free and looks better than it did before. The price was more than reasonable for the effort and quality delivered. My next project is my kitchen, and I know that I will call OzzieSplash again. 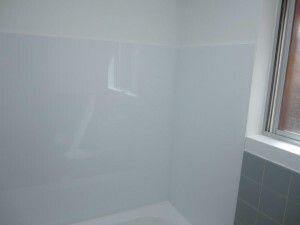 Emily had old tired tiles in her bathroom, and we spruced her Shower walls up by installing a stunning Acrylic Splashback. 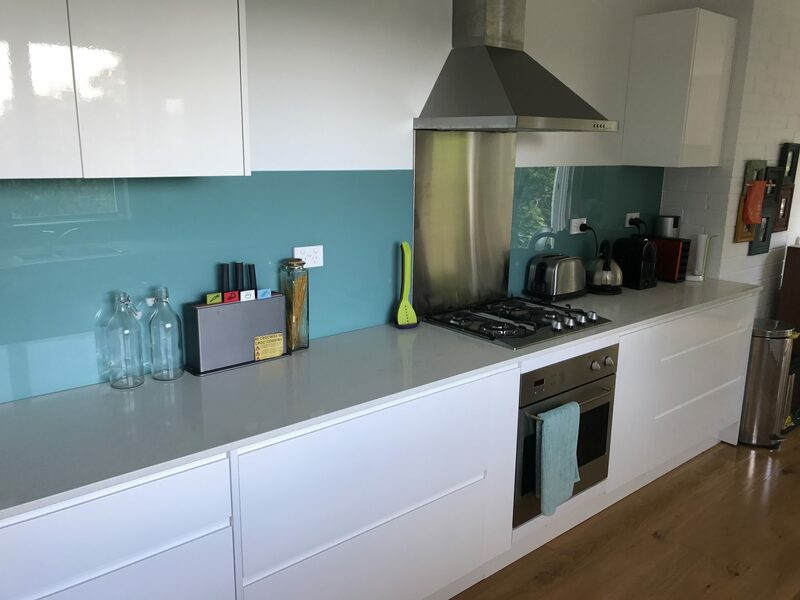 OzzieSplash colour matched Acrylic Splashback to a Dulux Colour ” Surf Wash” after customer painted two different colours on the wall to see what it will look like. Thank you very much for our delivery on Saturday. We both couldn’t be happier with the quality and colour. It was so easy to install and looks GREAT!! We will defiantly recommend you to friends and family or anyone else in need. Here are a few photos of before and after. Your prompt friendly service was amazing! Not many businesses like you guys. Thank you Andrea and Ozzie for a very professional job and great service. 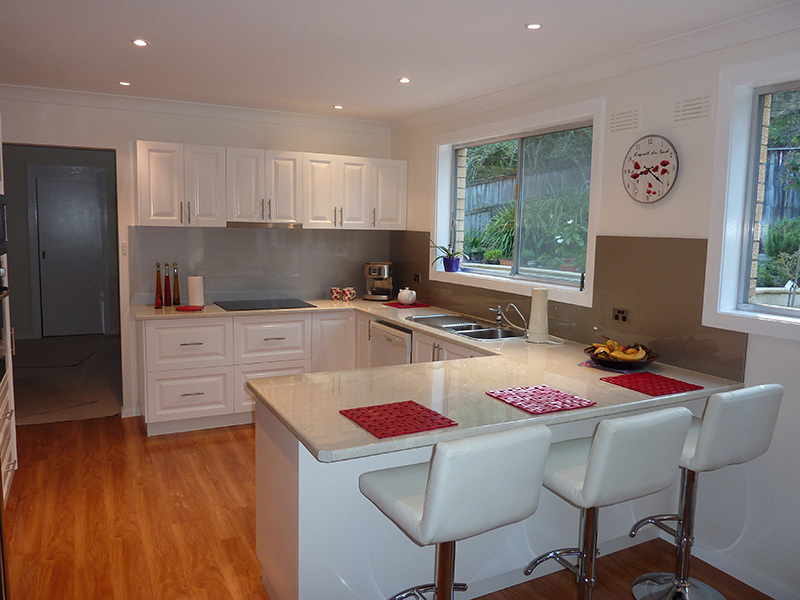 Our kitchen splashback looks great and has really modernized our revamped kitchen. I just wanted to send a quick message to say thank you for your service. I was very pleased with the way you both treated my (small) job as important to you as it was to me and my customer. It’s nice to be able to trust a supplier to deliver what you hope for. And the finished product was of high standard. Very impressed! Andrea and Ozzie were very helpful and professional. 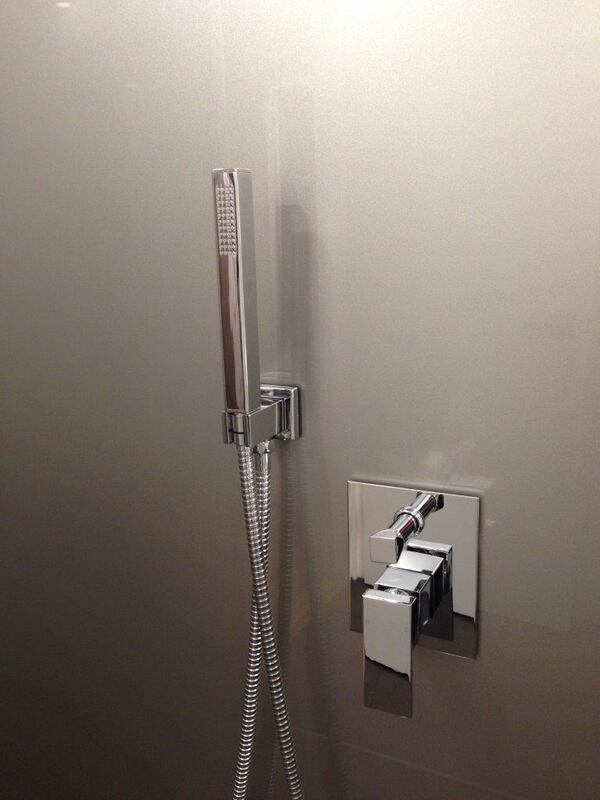 My new bathroom looks amazing with the metallic silver shower splashback they supplied and fitted. 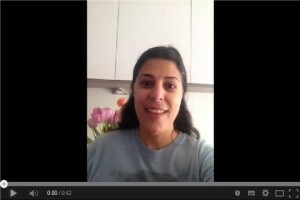 I am very happy with their work and great service. 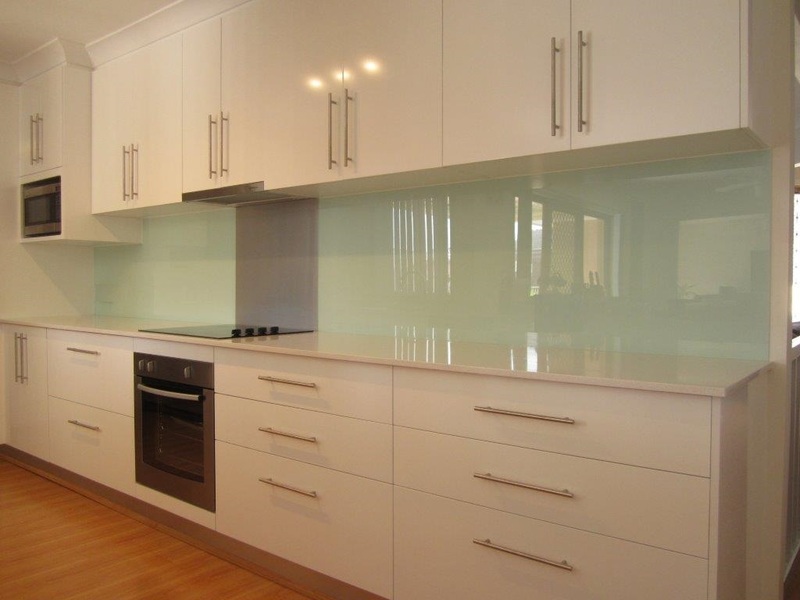 I would definitely recommend them to anyone looking to update their bathroom or kitchen with a stunning acrylic splashback from OzzieSplash. All the best – Steve B. 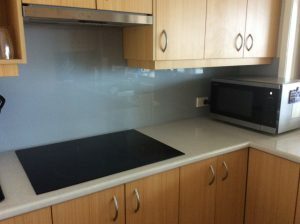 The splashback looks terrific and was easy to install. I made the required cut-outs with woodworking tools and was surprised by how simple it was. I have attached photographs of the end result. Thank you for making the process so simple and painless. I really appreciated that you worked with me to ensure that the delivery was made on the requested date. 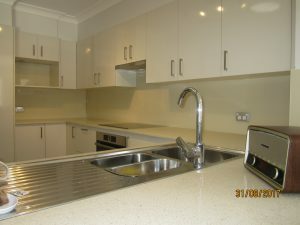 The splashback was securely packaged for delivery and arrived without incident. The price was very competitive and the colour ” Hog Bristle ” was exactly what I wanted. I would definitely use OzzieSplash again and would happily recommend it to others. Ozzie Splash transformed our boring tiled splash back into a show piece in our kitchen, the service and quality in work is second to none. 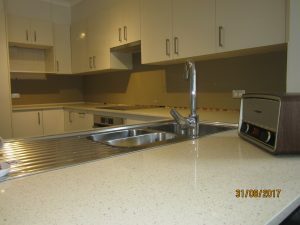 I am in the building trade so I see a lot of kitchens and would not hesitate in recommending Ozzie Splash to anyone. Thanks again Andrea and Ozzy for all your help and advice. I rang OzzieSplash after reading an article about them in the local Update and Renovate Magazine. Ozzie was over the very next day to measure up and provide samples and advice. 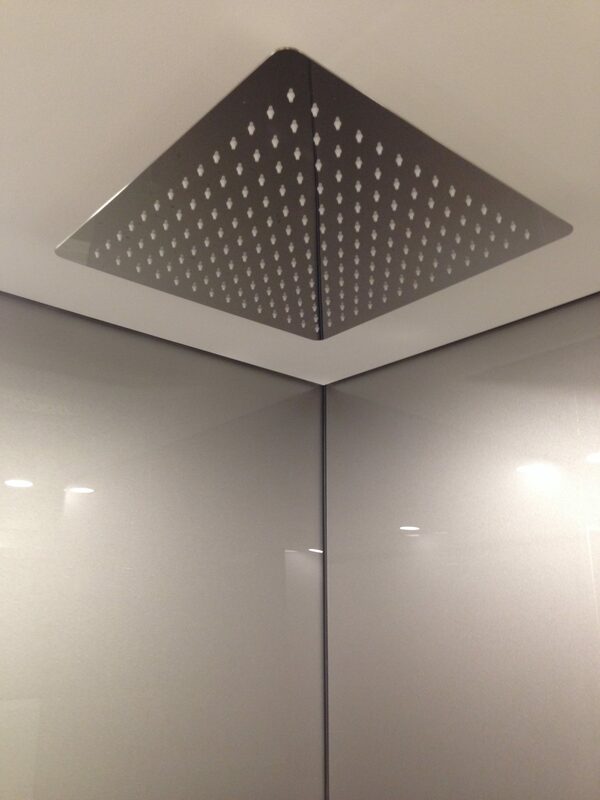 Within a few days of placing an order, Andrea rang to make a time to install the Shower splashback ! 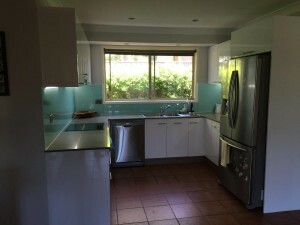 Super fast installation – No mess to clean up and an outstanding service. 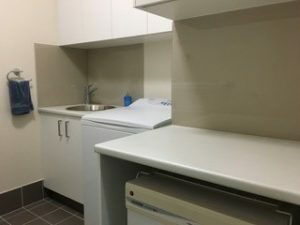 The splashback has really added the clean factor to our bathroom. 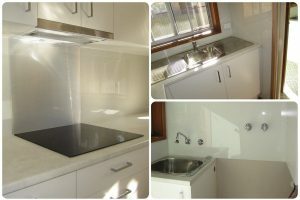 I would highly recommend Ozzie and Andrea to anyone looking for a high quality Splashback. 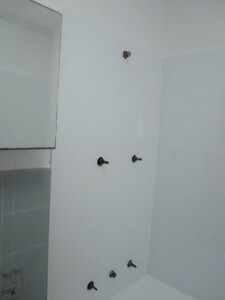 I would love to thank both Oswald and Andrea for your exceptional efforts with my Bathroom project! Both Oswald and Andrea have been an absolute delight through the first handshake to the last. They both went well above what anyone could possible expect in every aspect of my project! On numerous occasions Oswald drove to my house after his day had ended to gather measurements and fitment sizes in order to have my project looking right. This job was a small job but a Very Detailed one!! His advice, Professionalism, and attitude I could not fault, they have been very trustworthy and very kind hearted people. The product looked AMAZING and done the exact way I wanted it to be done, without Oswald this wouldn’t have ever happened! You are both THE BEST by far, business I have EVER delt with! You have got a lifetime customer. 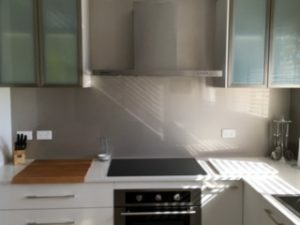 We must write to congratulate you and your company for the prompt, courteous and professional attention to the provision of the Acrylic Splashbacks to our new kitchen recently installed in our home. 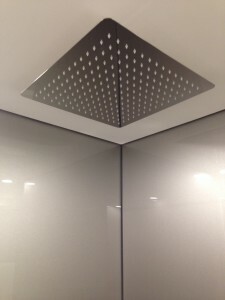 From day one your attention to detail was superb, your promptness in providing a quote, the making of a template and then the arrival of Ozzie for the final installation all went without a problem. The finished job is great. 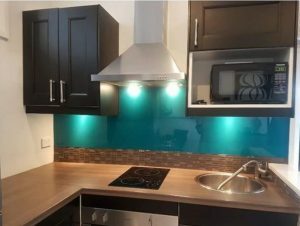 We are delighted with the finished product and can recommend your company and the Acrylic splash back to anybody intending using your services or the product. Their range of colours was great and I choose Lagoon Metallic. 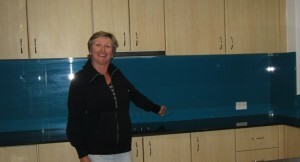 “I am so pleased I found Ozzie Splashback and Metaline”. 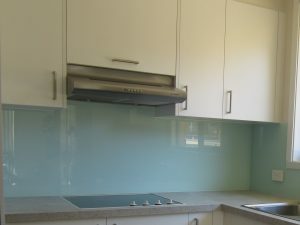 After numerous friends of mine had used glass splashbacks, I thought this was the only way to go to get the look I wanted for my new kitchen. But one of our friend had bad luck and her Glass Splashback shattered in millions of pieces – so we where looking for an alternative. 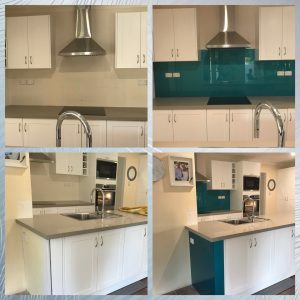 I contacted Ozzie Splashback and they showed me their range of Metaline splashbacks and I was amazed by it and fall in love with it. 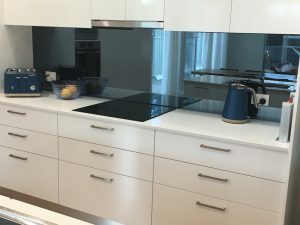 This family owned business gave the most professional service and I would recommend them to anyone thinking of new splashbacks for either kitchen or bathroom. 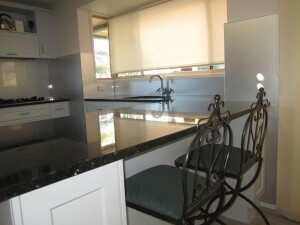 Thank you again for giving me the final touch to my dream kitchen”. Angela and I would just like to say thank you for a professional service. 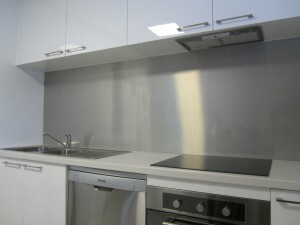 We are so pleased with the splashback fitted in our kitchen and laundry today. It looks spectacular and we wanted to pass our thanks back to you and highlight the excellent customer service you also provided. You were on time, within budget and took pride in your workmanship. 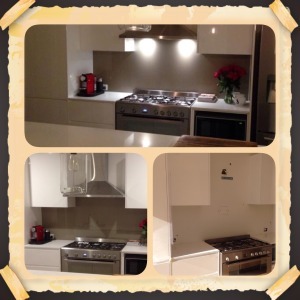 The ease of installation that resulted including placing the new splashback over the existing tiles was amazing. Recently I had dealings with Ozzie and Andrea form Ozziesplash. 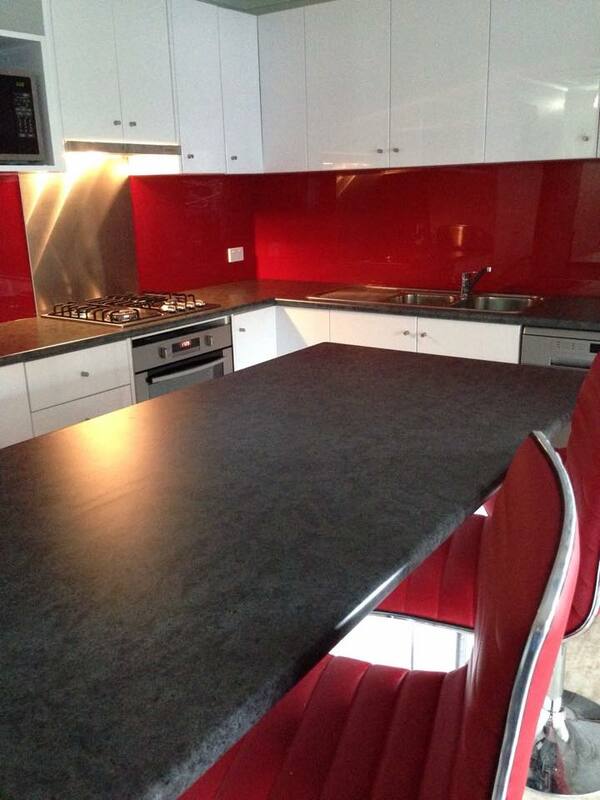 My wife had been to a friends place and admired the splashbacks in her new kitchen; she gave us the contact details. 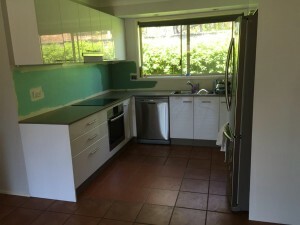 We went to the Showroom at 2/13 Grieve Close, West Gosford and were walked through the process by Ozzie and Andrea. 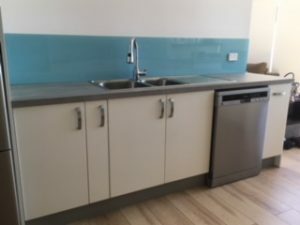 Our kitchen was not a complete refit but rather new bench tops which resulted in our existing splashback tiles being damage when the old Bench top was removed. The look of our Kitchen in my view has considerably enhanced and helped us realise the value of our property during the sale. Ozzie and Andrea are a delightful and helpful couple to conduct Business with and went out of there way help us with all aspects of the process including a very tight time frame. They offered advice and help every step of the way and my recommendation could not be high enough. Great people ….. Great product. I wanted to let you know how our kitchen splashback is going since you installed in June last year. We couldn’t be happier with it, not only does it look amazing, the red acrylic we chose gets people commenting as soon as they walk in; it’s incredibly easy to keep clean, I use a bit of window spray and a dry cloth and there are never any streaks! Being pretty house proud, ok, a complete neat freak, it’s the one part of the kitchen that keeps looking sparkly. We have also found that it’s still scratch free, and we have two young kids and one enthusiastic cook in the house! 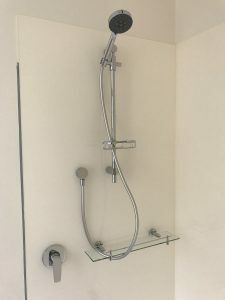 So thank you again for such a brilliant product and we look forward to using OzzieSplash and your Acrylic Splashbacks it in our new bathroom renovation next. “I found OzzieSplash by ‘accident’ but very glad we did! We were looking to buy a splashback and wanted to use Laminex’s Metaline product. Cheaper, lighter and much easier to install too. All our queries were responded to quickly and efficiently, the price quoted was more than fair, and ongoing contact and information gladly given. 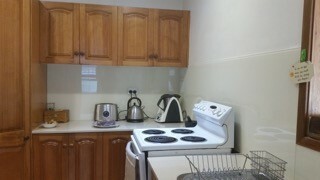 It has really completed the kitchen, I couldn’t be happier. Thank you so much for the superb job you have done installing my new Metaline splashback. I couldn’t have asked for anything more. Your direction in helping us decide on what colour and style to go with was most helpful. I look forward to doing business with you again on our next place. for all the time and effort you put into our fabulous new bathroom splashback! It looks amazing and we are extremely happy with the finished product. 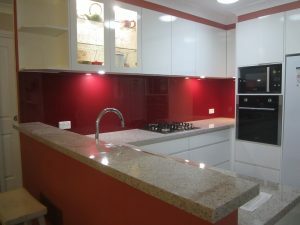 Our new Kitchen had been installed and we were undecided whether to have Tiles, Acrylic or Glass for our splashbacks. We saw an advertisement in the local paper for OzzieSplash. We met Andrea and Oswald and we knew we were in the right place. Oswald’s knowledge was very helpful and we decided to go with the. 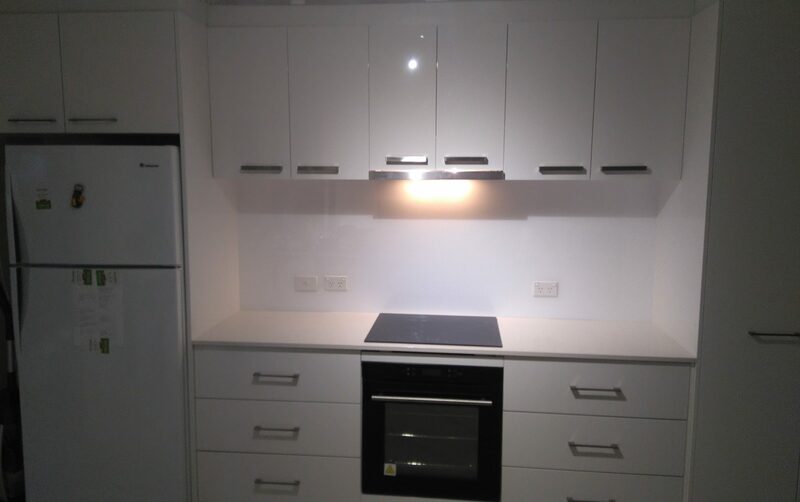 This was fitted in our kitchen and we are delighted. The workmanship was second to none. Metaline is so easy to clean – just a simple wipe over. 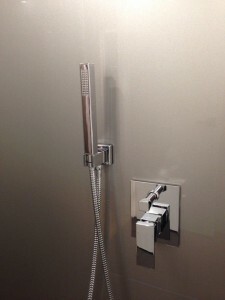 Both my husband and I are extremely happy with this product and the service from OzzieSplash. Dealing with Andrea and Ozzie was a pleasure and we would recommend this Company without hesitation. 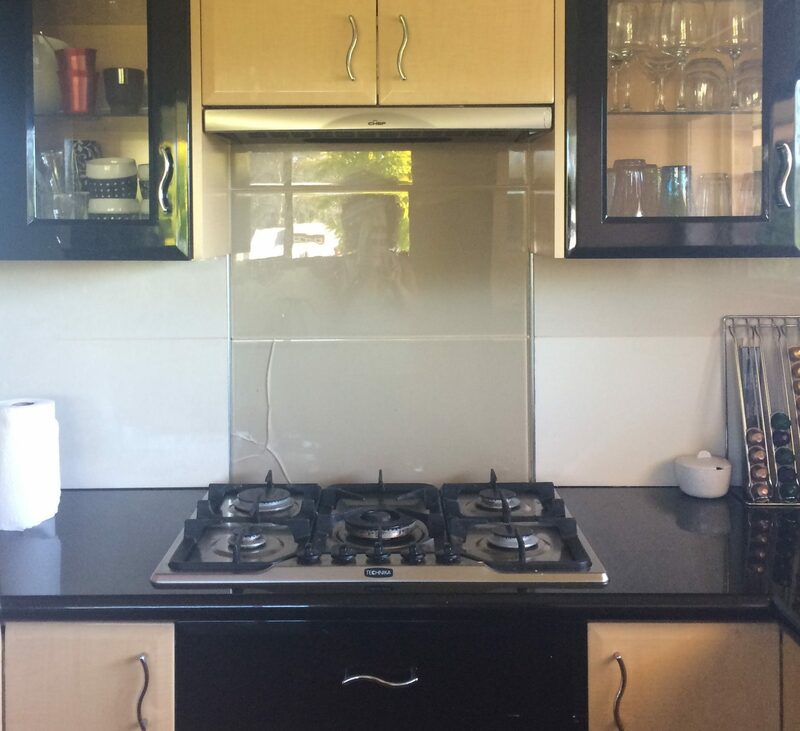 I just wanted to thank you both very much for our wonderful new splashback, we just love it. Your service was excellent; Ozzie was very professional and courteous to deal with. I had been recommended Ozziesplash by a friend and was pleasantly surprised with their level of customer service and knowledge of their products. 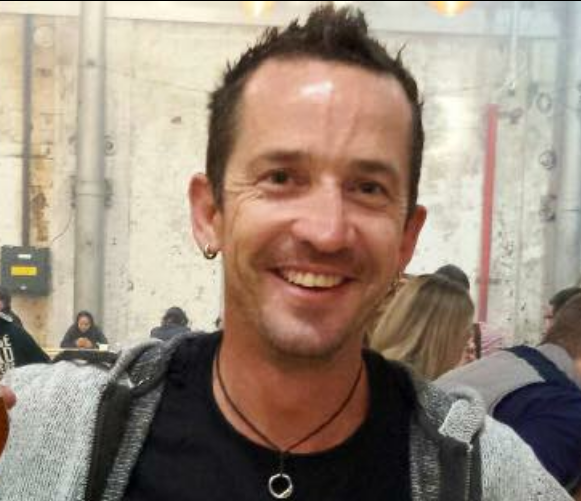 Ozzie showed us a “metaline” product which has made all the difference to my new DIY kitchen. It is very easy to clean and makes a stunning difference, both my husband and I are extremely pleased with the choice to go with Ozziesplash. I would thoroughly recommend this product and Ozziesplash. Andrea and Ozzie, you are both very lovely people and I know your company will be successful with the level of service you provide to your customers. I hope you are doing well ? 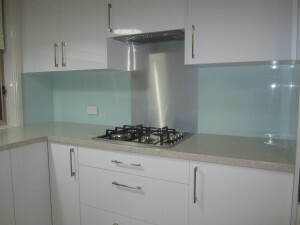 Here is a pictures of the splashbacks we successfully installed ourselves. The courier service from NSW to QLD was quick, reliable and reasonably priced – but most of all, the product arrived in perfect condition. 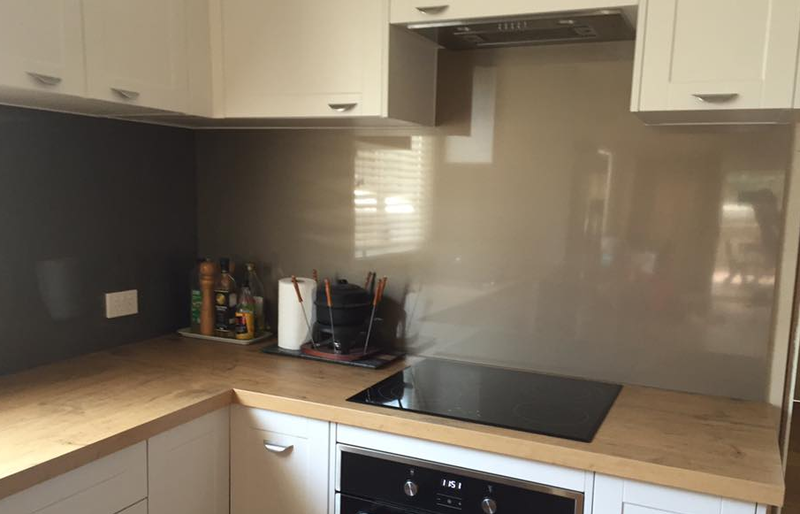 We have received so many comments and compliments on our splashback, and have referred many friends – we actually thinking of renovating our Bathroom with your product too. You were right, it was not hard to do, actually I was amazed how easy it was. 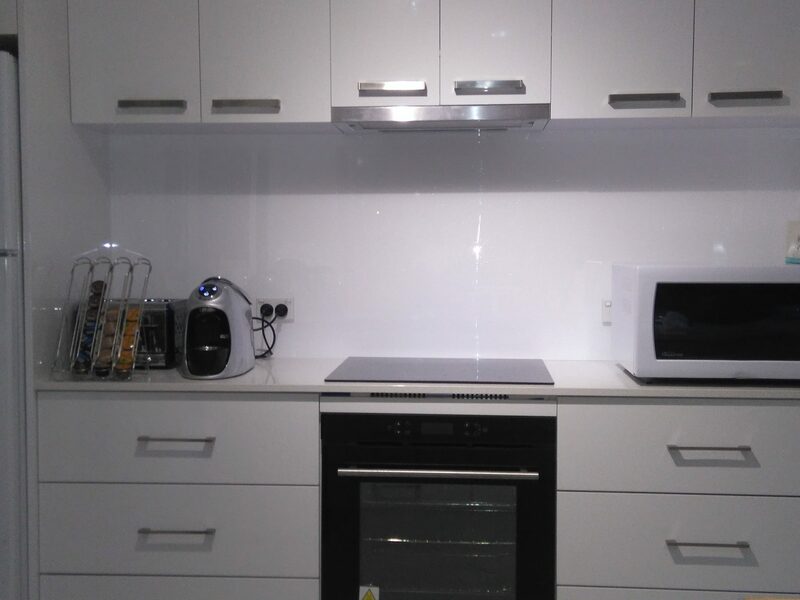 The Splashbacks are really great exactly like we expected. The Stainless Steel insert brings out the the great look. 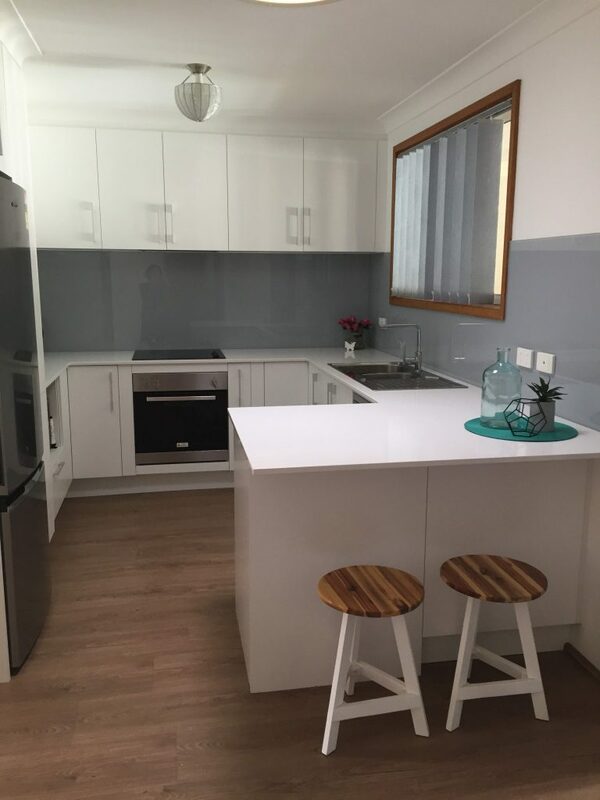 And you’ve been so helpful and patient to get everything right…the suggestions, on how to measure and glue the splashbacks onto the walls… the colour …the power point cut outs and the installation of the insert as well as the before and after photos. The hardest part was choosing the right colour – from your huge range of Dulux Colours. 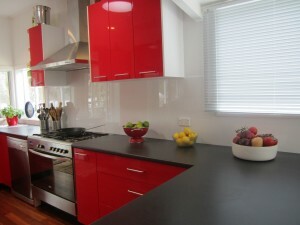 I am so pleased that I have choosen Ozziesplash and how easy it is to clean and how stunning everything looks. I will definitely suggest you and your company to my friends and collegues and can never thank you enough.